They’re underachievers and proud of it. Bart, Homer and the rest of the Simpsons put the “nuclear” in the nuclear family sitcom, while Jerry Seinfeld scores with a show about “nothing.” Six Friends make twentysomething coffee talk chic, teens turn on to Buffy, Dawson, and the kids from 90210, something weird this way comes on The X-Flies, and success comes to everything from the silly (Home Improvement) to the serious (ER) to the seriously silly (can you say “Urkel”?). With six networks and umpteen cable channels, everybody’s got a show, anyone can be a star, and by the end of the decade, everybody wants to be a millionaire. 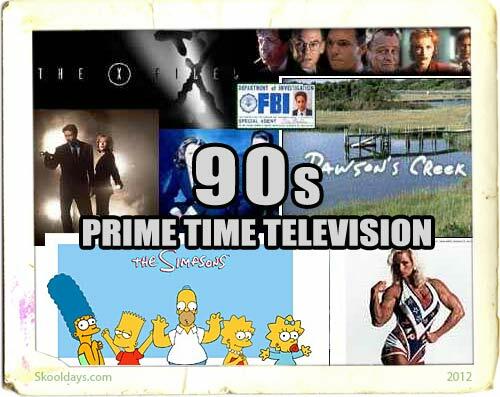 This entry was posted in PrimeTime and tagged 1990 by Skooldays. Bookmark the permalink.